Mafia turncoat John Alite will reveal how he teamed with Burke to murder Bruce Gotterup in 1991. In earlier trial, Alite stunned court admitting to steamy affair with Victoria Gotti. 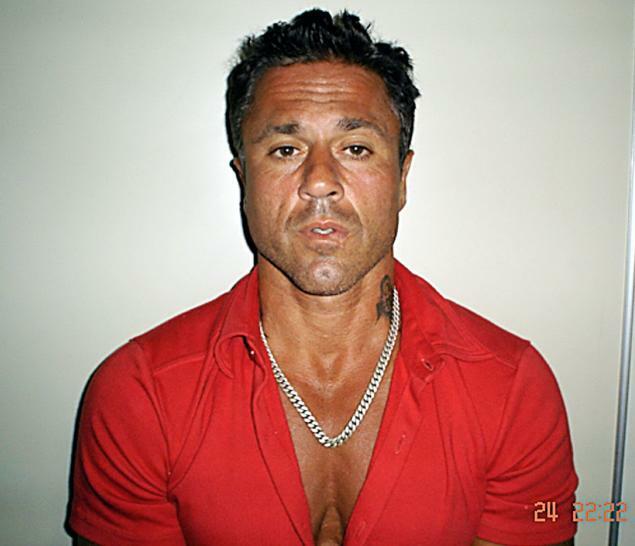 John Alite, seen here in this 2004 mugshot, is ready to deliver a knockout punch to his ex-crony on behalf of Bruce Gotterup’s family. Three years after he testified against John A. (Junior) Gotti, the mob scion’s former best friend is returning to court with one last score to settle against the Gambino crime family. 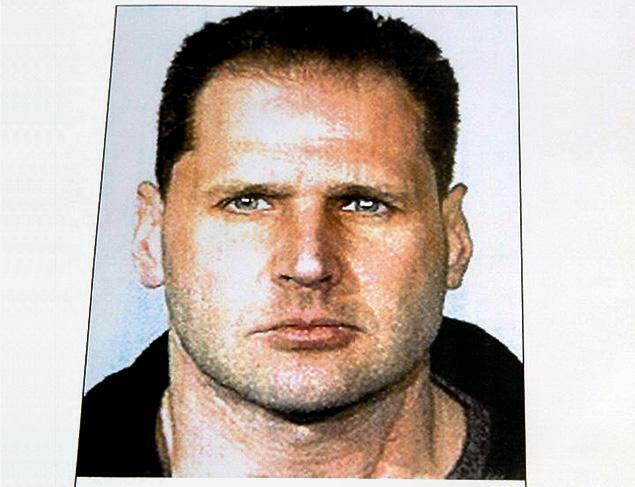 Mafia turncoat John Alite will read a blistering statement at the sentencing Friday of John Burke, his co-conspirator in the 1991 gangland murder of Bruce Gotterup, the Daily News has learned. “They have always had a sense of forgiveness and I will be sticking up for them,” he said about the Gotterup family in an exclusive interview with The Daily News. Alite didn’t take the stand at Burke’s murder trial last year, but he sparred with Gotti during the mob boss’ 2009 federal trial on charges that he approved the Gotterup killing. At one point, Junior called Alite a “punk dog” in the courtroom. Mugshot of John Burke, who is being sentenced for the murder of Bruce Gotterup. In an earlier trial of another Gambino mobster, Alite stunned the court by revealing he had a steamy affair with mob princess Victoria Gotti, Junior’s sister, in the 1980s when she was dating her future husband Carmine Agnello. She denied any relationship. Prosecutors failed to prove Junior’s connection to the Gotterup slaying. Now, Alite is ready to deliver a knockout punch to his ex-crony on behalf of Gotterup’s family. Alite said he will out Burke, who faces life in prison, as a fraud for portraying himself on an Internet blog as a Bible-quoting Christian who claims to have found religion in prison. 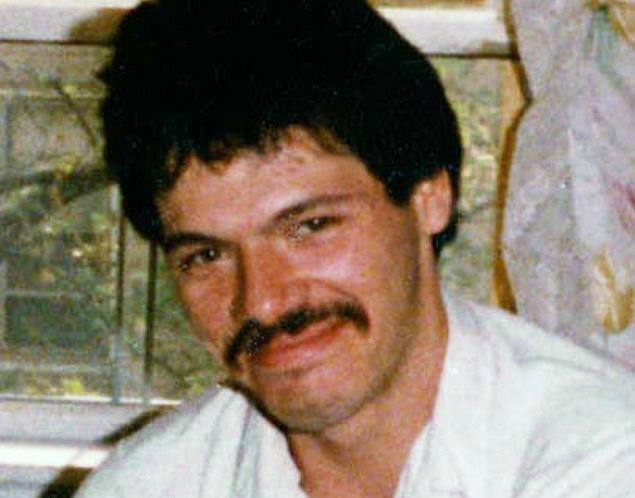 Bruce Gotterup was murdered by John Burke in 1991. John Alite intends to read a statement that will implicate himself and John A. (Junior) Gotti in his murder. “If he really believes the Bible, then he should tell the truth,” Alite, 50, said. Alite has kept a low profile since he was released from prison last spring after completing a 100-month sentence for his part in Gotterup’s murder. But he dodged a life sentence by helping the government prosecute Junior and other members of their murderous crew that pushed drugs in Queens in the 1980s and left a trail of dead bodies. He couldn’t deliver a conviction against Junior, whose trial ended in a hung jury. But his testimony did result in guilty pleas by other crew members and the conviction of Gambino hitman Charles Carneglia. In addition to their business partnership, Alite and Junior used to be fast friends. Junior was Alite’s best man at his wedding, even convincing him to get hitched on Valentine’s Day because it was Junior’s birthday. And Alite attended his wedding at the Helmsley Palace Hotel, which was a who’s who of mobsters. Because he was of Albanian descent and not Italian, Alite could never have been a made man. Still, prosecutors said he was endowed with a more powerful status than other mob associates because of his ties to Junior and his sheer ruthlessness. Alite estimates he made millions of dollars, owned nine homes, six businesses and three nightclubs. He said the priority now is keeping his 21-year-old son John Jr. on the straight and narrow and disrupting the mob’s recruiting pipeline of young men lured by false dreams of money and honor — like he was while growing up in Woodhaven, Queens. “I ruined my life the way I went,” Alite said. “Before I went to jail I was a good father but I was like two different people. On the street I was vicious. My kids are never gonna go through what I did. Alite said he met with Debra Gotterup, Bruce’s wife, and her daughter about a year ago and told them he was sorry he ruined their lives as well as his own. Debra Gotterup, of Long Island, said said she believes he’s sincere. 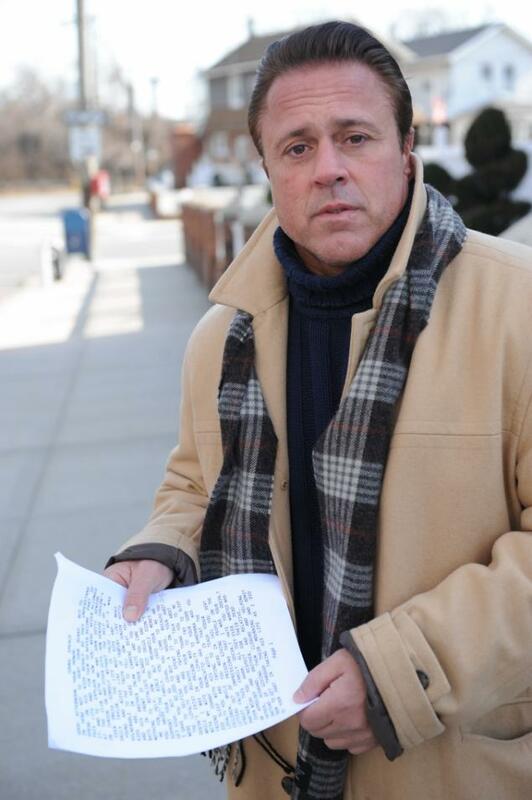 John Alite holds a statement he’ll make in court revealing how he teamed with John Burke to murder Bruce Gotterup. “He’s trying to change his life and I believe everyone deserves a second chance,” she said. As for Burke, she’s looking forward to seeing him sentenced to prison today in Brooklyn Federal Court. “I can’t wait for Friday and I’ll never forgive him. He’s the one who pulled the trigger,” she said. Alite’s scorn goes beyond Junior to his father, the Teflon Don. He laughs at the mention of a major motion picture about the elder John Gotti that Junior backs — calling it a “Cinderella” fairy tale that takes liberties with the truth. Alite, who spent several nights a week sleeping over the Gotti home in Howard Beach back in the day, said the Dapper Don couldn’t properly dress himself without the help of a tailor. Alite’s road ahead has cinematic themes — part “A Bronx Tale” trying to protect his sons from trouble and part “Carlito’s Way” staying clear of trouble himself. Inevitably he runs into a familiar face from his illicit past. Sometimes they will say hello and tell him not to tell anyone they spoke to him. Others call him a rat or ignore him. He’s also painfully aware of the ever-present danger of retribution faced by every mob rat. “Every day I walk out the door I check out everything,” he said, noting that he balked at entering the witness protection program. “I’m not going to be one of those guys who gets killed in the street if I can help it, but I’m not gonna go live in Utah. Excerpts from a statement former Gambino associate John Alite will read in federal court Friday during the sentencing of John Burke for the 1991 murder of Bruce Gotterup.